Prof. Vojin G. Oklobdzija is President and CEO of Integration Corporation, Berkeley, California. He holds Ph.D. and MSc degrees in Computer Science from the University of California, Los Angeles, Dipl. Ing. (MScEE) degree in electronics and telecommunications and is a Life Fellow of IEEE and President of IEEE Circuits and Systems Society from 2014 to 2016. He brings 30 years of industrial and research experience in computer architecture, systems, circuits and low-power design. Prof. Oklobdzija worked on development of early RISC and super-scalar RISC architecture and processor at IBM T.J.Watson Research Center in New York from 1982-1991. From 1988-90 he was teaching at the University of California Berkeley as a visiting IBM faculty . His industrial experience includes Microelectronics Center of XEROX Corporation, consulting positions at Sun Microsystems Laboratories, AT&T Bell Laboratories, Siemens Corp., Texas Instruments, Hitachi Research, Intel Corp, Samsung, Sony and various others. He holds professor position at the University of California. He was visiting professor at EPFL, Switzerland and Distinguished Visiting Professor under Korea IITA program. 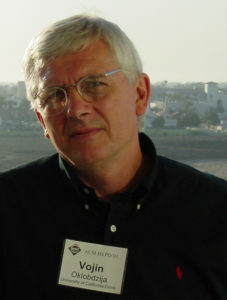 Prof. Oklobdzija’s expertise is in VLSI system design, fast circuits, low-power design and efficient implementations of computer arithmetic. His work has been used in several leading processors. Prof. Oklobdzija holds fourteen USA and four European patents in the area of circuits and computer design with several more pending. He has published over 150 papers in the areas of circuits and technology, computer arithmetic and computer architecture and written a dozen book chapters. He published four books in high-performance and low-power system design. Prof. Oklobdzija is a Distinguished Lecturer of IEEE Solid-State Circuits Society and has given over 150 invited talks in the USA, Europe, Latin America, Australia, China, Korea and Japan and a number of industrial short courses.